Showy mix features winning varieties from leading daffodil growers and hybridizers—and blooms all spring! Includes early-, mid- and late-spring bloomers in a variety of flower forms, colors and shapes. When planted en masse, our Spring Bonanza Daffodil Mixture adds pizzazz to borders and woodland settings. When the foliage is allowed to fade naturally, you'll be assured of the same colorful show for years to come. 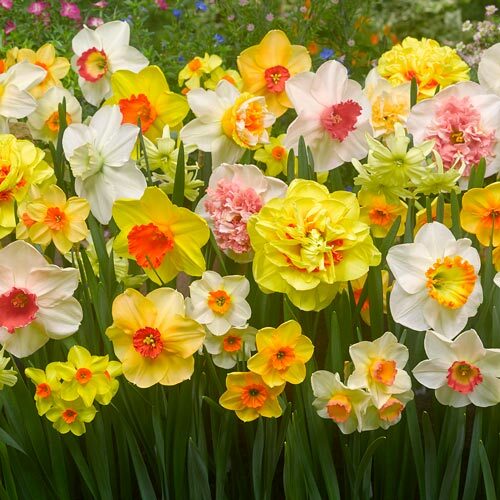 Daffodils, or narcissus, perform best when the bulbs are planted in well-drained soil in full sun or partial shade. Daffodils are easy to grow and deer resistant. Bulb size: 12-14 cm. Rich, long green, strap like leaves.